When making a change to an active Console Pay tenant to any field that affects their Payment Schedule e.g. Rental increases, Vacate dates, etc., a prompt displays …Please make the appropriate changes in the schedule… then the Tenant Payment schedule must be updated. To Update Tenant Payment Schedule, go to the Tenant file, click Tools then Console Pay. 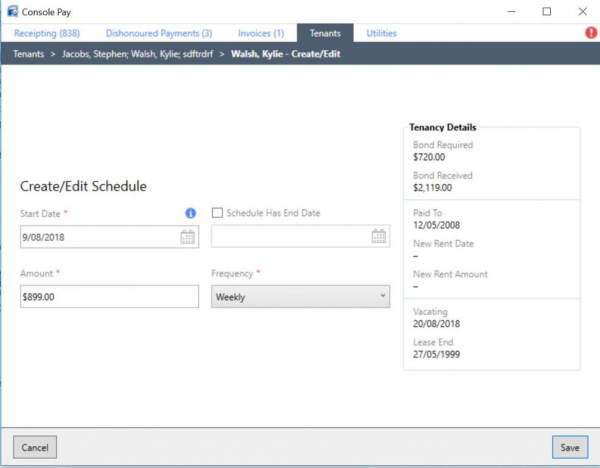 Click View and Edit Schedule, then go to Create/Edit Schedule – if the change is an entered vacate date, the date shows on the tenant schedule under Vacate. In this example, you are required to tick Schedule Has End Date, then select Generate Payments Until the Vacate Date e.g. 20/08/2018. Click Create/Replace Schedule to update the schedule to include payments up to the vacate date. Note: the system updates to the nearest week due only. 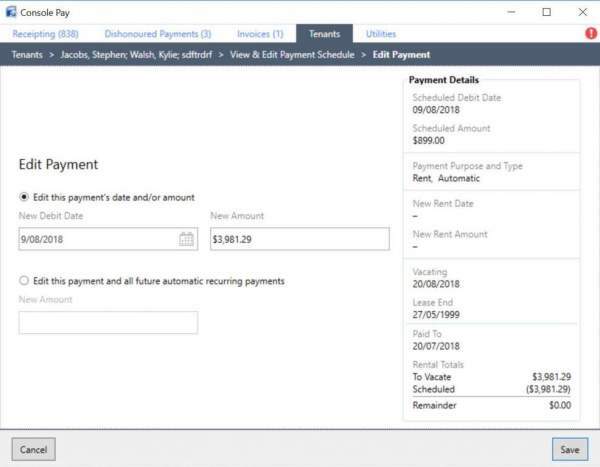 The amount required to vacate and the sum of remaining scheduled payments is displayed on screen, the remainder can then be adjusted to ensure you take correct funds prior to vacate. Once the Remainder display as ”-” then the tenants rent to vacate is covered.